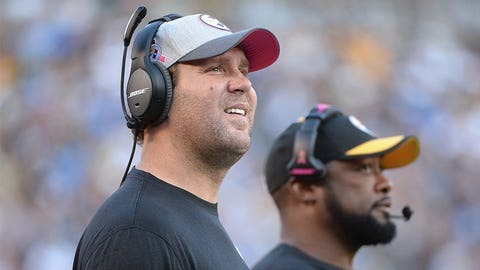 Injured quarterback Ben Roethlisberger has been watching from the sideline with head coach Mike Tomlin for the Pittsburgh Steelers' past two games. PITTSBURGH — Ben Roethlisberger took a small step toward returning to action and that left his Pittsburgh Steelers’ teammates feeling good. The veteran quarterback was a limited participant in practice Wednesday for the first time since spraining the medial collateral ligament in his left knee Sept. 27 during a win over the Rams at St. Louis. Roethlisberger took part in non-contact seven-on-seven passing drills. While he is not expected to play in Sunday’s game against the visiting Arizona Cardinals, Roethlisberger appears to be on course to beat the original timetable of missing six weeks. "We’re just taking it one day a time," he said. However, practice got a bit livelier once Roethlisberger took his 15 snaps. "It was really good to see that; very encouraging," guard Ramon Foster said. "But until he’s ready, we really can’t focus on that. We’ve just got to stick with the plan." Roethlisberger said the determining factor in being game ready will be when he feels he is mobile enough to protect himself. "The biggest thing is being able to avoid the pass rush," he said. "I can walk around fine. I can step and throw. But being able to make the subtle moves inside the pocket, and outside the pocket, too, is important. I have to make sure I am able to do that." 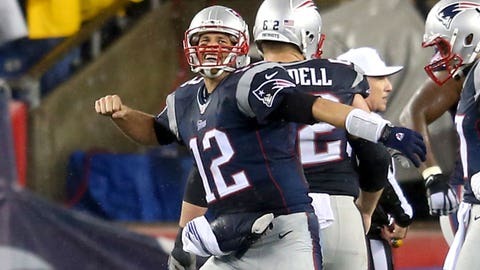 Who are the Patriots' biggest rivals? 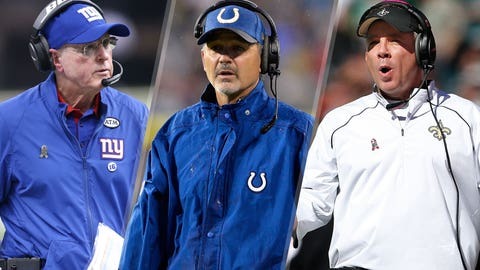 We break down the top 10 teams and people who can't stand New England. The Steelers (3-2) have split their two games with Mike Vick as the starting quarterback. They lost to the Baltimore Ravens in overtime and then rallied to beat the Chargers 24-20 on Monday night at San Diego when Le’Veon Bell had a 1-yard touchdown run as time expired. The Steelers have simplified their offense for Vick, who signed as a free agent just before the start of the regular season when backup quarterback Bruce Gradkowski was placed on injured reserve. Vick said he is still not completely comfortable with the offense. "I’m working extremely hard," said Vick, a four-time Pro Bowl selection. "I’m still a ways away but the confidence is still there. The coaches are doing a good job of helping me understand what we’re doing. It’s more a matter of getting down the details now. I’m trying to make a play here or there, trying to find some consistency." Roethlisberger was off to an outstanding start, completing 75.3 percent of his passes for 912 yards and four touchdowns in a little more than two games. He has missed just 20 games in his 12-year career and acknowledges it is difficult to stand on the sideline. "It’s hard to watch when you really want to be out there," Roethlisberger said. "I’m just trying to be the best on-the-sideline guy I can be. I don’t want to be overbearing because Mike’s been doing this for a long time and he’s a real pro. I’m just here to help him in any way I can." Wide receiver Antonio Brown has been affected by the change in quarterbacks. He has just eight catches for 87 yards in Vick’s two starts after having 29 receptions for 436 yards in the first three games. Interestingly enough, Brown ended practice by throwing a long pass to Vick on a reverse flea-flicker play. "That was awesome," Vick said with a smile. "Maybe I should switch positions." Brown also got a kick out of being on the other end of a pass play. "I told Mike that that’s how you throw the ball," Brown said. "Don’t be afraid to take a shot down the field." NOTES: CB Cortez Allen (knee) and LB Ryan Shazier (shoulder) were also limited practice participants. Shazier has missed three straight games. . S Will Allen (ankle), LB Jarvis Jones (hip) and C Doug Legursky (back) did not participate in practice.